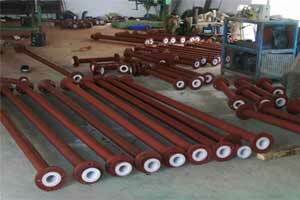 Other required pipe materials such as API pipe, stainless steel or alloy steel pipes would be available to meet service conditions and should be referred to us. Flanges confirming to ANSI / BS10 / DIN or any other international standard will be supplied in Mild steel, Carbon steel, Stainless Steel. Standard flanges are Slip-on type and Lap-joint type flanges and will be provided if requested at the time of making an offer. The polymer resin shall meet the STM Standard Specifications and our standard PP liners are unpigmented and natural white color. The colored liners are available if specially requested. Standard fittings include 90°C Elbow, 45°C Elbow, Reducing 90°C Elbow, Equal Tees, Reducing Tees, Instrument Tees, Concentric Reducers, Eccentric Reducers, Laterals and Cross for 1" (25mm NB) through 8"(200 mm NB) diameter. Non - standard fittings such as double and triple branch tees, other special shapes are available per the customer's requirements. 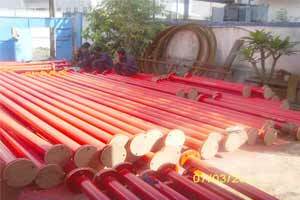 All lined pipe and fittings are subjected to 10-15 KV ( SPARK TESTING) non-destructive electrostatic test which is carried out to detect any defects in the liner such as pin holes, porosity, cracks, etc. According to the customer's request, hydrostatic testing will be carried out at room temperature using clean water. All lined pipe and fittings are subjected to the visual inspection to detect any defects such as liner surface cracks, deformation, outside paint coating, etc. PP lined fittings shall be stored in a shaded area on wooden supports. Wooden or plastic end protectors are used to protect the PP lined sealing faces of flanged fittings. End protectors should stay in place until immediately prior to installation. Avoid dropping or impacting lined pipe and fittings with heavy objects or storing near high traffic areas.